Boozy Butterscotch Crock Pot Apple Cider is deliciously sweet, lightly spiced, and perfect for fall! Make it in a crock pot and let your guests serve themselves. 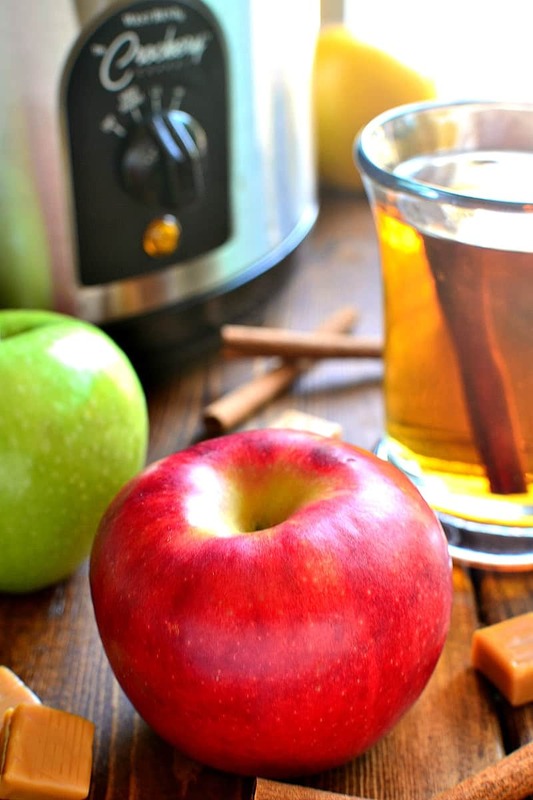 This slow cooker apple cider recipe is sure to be the hit of the party! You know how some people are just naturally more cluttery than others? And no matter how much time they spend cleaning, things will still look at least a little bit messy? Well, that’s me. And, like it or not, it’s been me for as long as I can remember. Sure, there have been times when I’ve been more focused on keeping my house clean…and there was even a year or so when you might have said I was slightly obsessed. For the most part, though? Orderliness and I do not go hand in hand. To be honest, it’s not something I feel good about. In fact, it’s at the top of my list of things I would change about myself if I could! Because it’s kind of embarrassing and kind of annoying and on a very real level, I feel like it affects our quality of life. We seriously spend SO much time decluttering….yet, our house is never clean. Tell me I’m not alone. Well, with the holidays approaching, and multiple events coming up that require some level of cleanliness, I’ve really been trying to stay on top of things. By cleaning up nightly and having the kids do the same. By saying yes to random people stopping by…because sometimes it seems like that’s the only thing that gives me any motivation! Are we still cluttery? YES. But not to the degree we have been….and that, my friends, is a win. Because even if you can’t really change who you are, you can take baby steps to make things better. And that’s exactly what we’re trying to do. And you know what? It feels worth it. Because somehow having a clean house makes everything better! 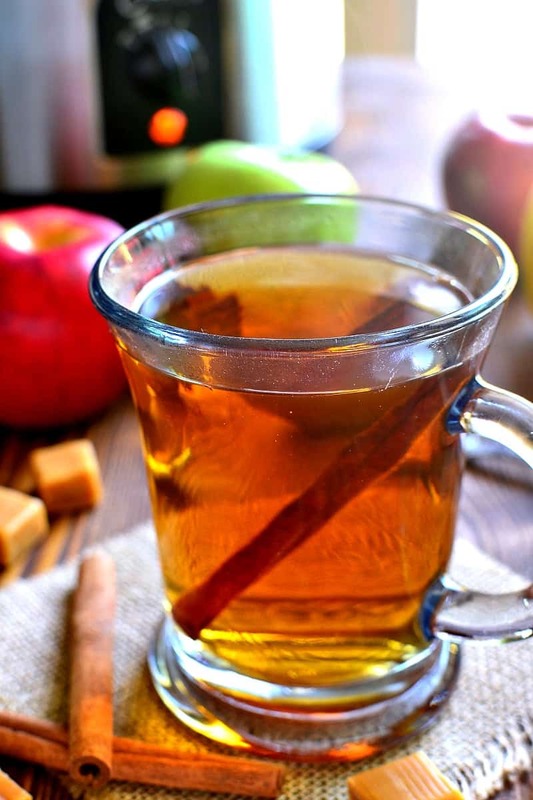 Including Boozy Butterscotch Crock Pot Apple Cider. 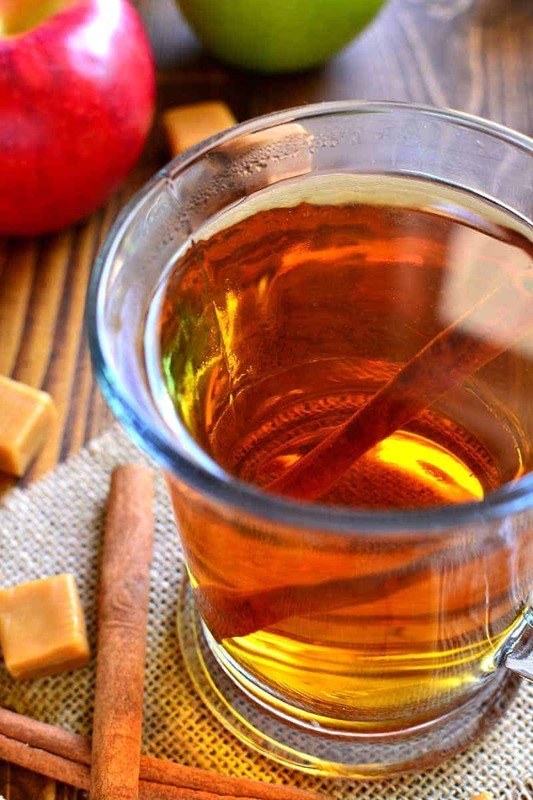 An adults-only apple cider is SO much more enjoyable in a clutter-free house. In my ideal world, I’d sit down nightly with a blanket and a book and a mug of it. And, of course, a clean house. But since that might not be totally realistic, I’m focusing on the holidays for now. You better believe this Boozy Butterscotch Crock Pot Apple Cider will be making many an appearance. Because it’s so easy and SO delicious! 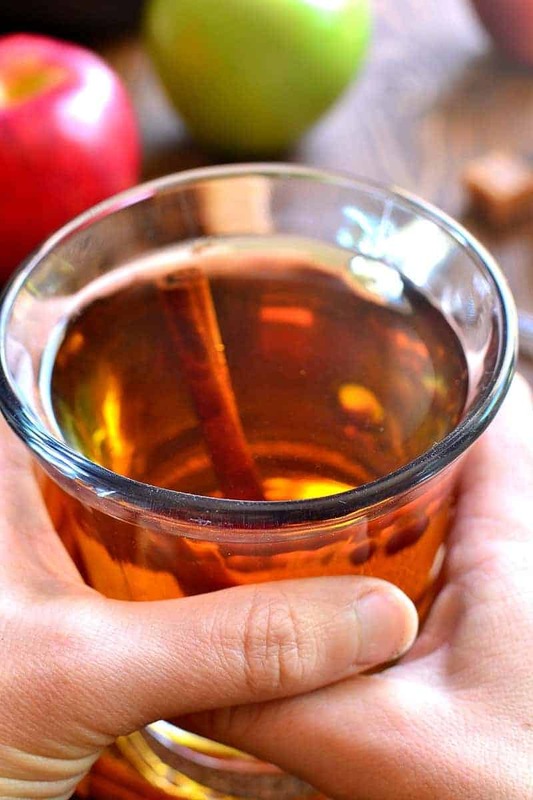 Apple Cider + Butterscotch + Fall Spices + Booze = ADULT BEVERAGE PERFECTION! Regardless of the condition of your house, please promise me you’ll make yourself a batch of boozy butterscotch crock pot apple cider. If booze isn’t your thing, make this recipe without it, or try my recipe for Crock Pot Spiced Cranberry Apple Cider. 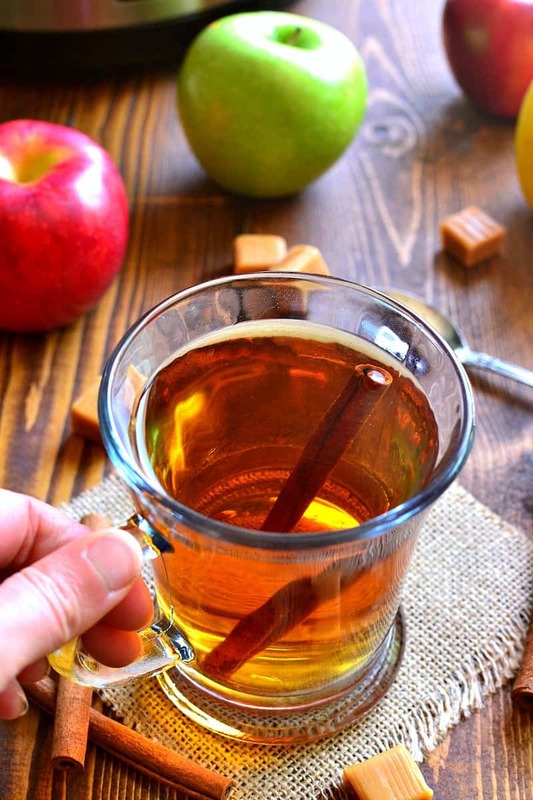 This Boozy Butterscotch Crock Pot Apple Cider is deliciously sweet, lightly spiced, and perfect for fall! 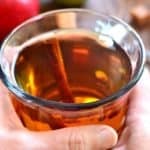 Stick it in a crock pot and let your guests serve themselves....this apple cider is sure to be the hit of the party! Combine all ingredients in a large crock pot. Heat on high heat 2-4 hours or low heat 4-6 hours. For more great drink recipes, check out my Pinterest boards! I totally know what you mean! I’m a little more cluttery than some (mainly with paperwork–like, where am I supposed to put all those magazines and mail?? ), but I do try my best to be as organized as possible, lol. This drink is gorgeous! A perfect celebration to getting more organized! YES! Paper stuff is the worst!!! My ONE house rule is clean enough to be healthy, dirty enough to be comfortable. My former borderline obsessive neatness ended when I was diagnosed with ADDD~long name meaning my back controls my entire life. Cleaning is no longer as important as being able to walk or cook a meal. It totally SUX but it could be so much worse!! I’m glad you’ve been able to adopt a new rule for yourself and your house….I just may steal that one for myself! Sorry to hear about your back, but I’m glad that keeping an ultra clean house has taken a back seat! I’m pretty excited that you added butternut schnapps and brandy to a hot apple cider! YUMMY! I love this time of year for several reasons, and being able to snuggle up to mug of hot punch is one of them! I think the family Christmas party will be way more fun if I bring this along 😉 Looks yummy! Slow cookers are the best! I have some friends who would be thrilled with this! You are DEFINITELY not alone here, it’s my biggest bug 🐛 bear 🐻, I have 5 kids and I’m a single Momma so of I’don’t do it, it stays that way…… And if I DO do it it ends up bad again, I feel your pain! It’s like fairies have been behind me messing up the way…. Sigh at least I’m happier by seeing this awesome region it screams autumn to me and yummy thankyou for your honesty, it’s helped me a lot, and the recipe! Yes! It IS like messy little fairies are behind me constantly….I feel your pain! I can’t imagine doing it alone. You have my utmost respect! Oh wow so easy. I should make this for the holidays! It seriously couldn’t be easier!